Most sweet Jesus, humbly kneeling at Thy feet, we renew the consecration of our family to Thy Divine Heart. Be Thou our King forever! In Thee we have full and entire confidence. May Thy spirit penetrate our thoughts, our desires, our words and our deeds. Bless our undertakings, share in our joys, in our trials, and in our labors. Grant us to know Thee better, to love Thee more, to serve Thee without faltering. 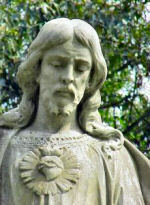 The Sacred Heart And The Eucharist  John A. Hardon, S.J. Doctrinal Foundation of Devotion to the Sacred Heart  John A. Hardon, S.J. Worship Of The Physical Heart Of Christ  Fr. Bertrand de Margerie, S.J. Devotion To the Sacred Heart: Part I  Peter C. Milward, S.J. Devotion To the Sacred Heart: Part 2  Peter C. Milward, S.J. Sacred Heart of Jesus, Font of Love and Mercy. 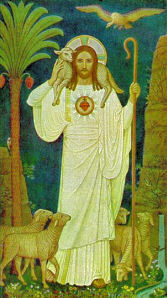 The Month of June (Overview - Calendar) is dedicated to the Sacred Heart. The Church celebrates the Solemnity of the Sacred Heart of Jesus on the Friday following the second Sunday after Pentecost. In addition to the liturgical celebration, many devotional exercises are connected with the Sacred Heart of Jesus. 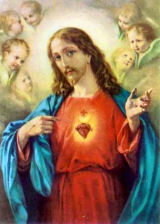 Of all devotions, devotion to the Sacred Heart was, and remains, one of the most widespread and popular in the Church. Here are some of the relevant documents: Leo XIII in his Encyclical Letter Annum sacrum (1889) on the consecration of mankind to the Sacred Heart; Pius XI in Caritate Christi Compulsi (On The Sacred Heart) and Miserentissimus Redemptor (On Reparation To The Sacred Heart); Pius XII in his Encyclical Letter Haurietis aquas; Paul VI in his Apostolic Letter Investigabiles divitias Christi (1965) and John Paul II in Message on the centenary of the consecration of mankind to the Sacred Heart of Jesus (1999), in L'Osservatore Romano, 12 June 1999. Jesus, who is one with the Father (cf. John 10, 30), invites his disciples to live in close communion with him, to model their lives on him and on his teaching. He, in turn, reveals himself as "meek and humble of heart" (Mt 11, 29). 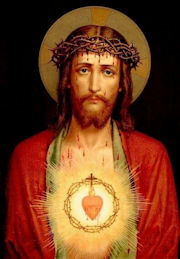 It can be said that, in a certain sense, devotion to the Sacred Heart of Jesus is a cultic form of the prophetic and evangelic gaze of all Christians on him who was pierced (cf. John 19, 37; Zac 12, 10), the gaze of all Christians on the side of Christ, transfixed by a lance, and from which flowed blood and water (cf. John 19, 34), symbols of the "wondrous sacrament of the Church"(St. Augustine). The Gospel of St. John recounts the showing of the Lord's hands and his side to the disciples (cf. John 20,20), and of his invitation to Thomas to put his hand into his side (cf. John 20, 27). 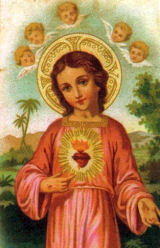 This event has also had a notable influence on the origin and development of the Church's devotion to the Sacred Heart. These and other texts present Christ as the paschal Lamb, victorious and slain (cf. Apoc 5,6). They were objects of much reflection by the Fathers who unveiled their doctrinal richness. They invited the faithful to penetrate the mysteries of Christ by contemplating the wound opened in his side. Augustine writes: "Access is possible: Christ is the door. It was opened for you when his side was opened by the lance. Remember what flowed out from his side: thus, choose where you want to enter Christ. From the side of Christ as he hung dying upon the Cross there flowed out blood and water, when it was pierced by a lance. Your purification is in that water, your redemption is in that blood".